NEW! Quick and Easy Encrypted Disk Cloning† — creates a complete clone of an encrypted disk with all data in its original encrypted state. NEW! Complete Disk Imaging† — captures, stores, and restores complete disk image file backups for an encrypted disk with all data in its original encrypted state. EXCLUSIVE! AccuClone™ Technology — exclusive disk imaging technology that not only ensures a precise image, but also retains all encrypted data in its original encrypted state. EXCLUSIVE! Automatic Copy Verification™ — assures the reliability and dependability of the image by ensuring data is not corrupted during the imaging process by faulty RAM, a defective cable, failing disk, or bad controller interface. EXCLUSIVE! USB Boot Capability† — creates a fully bootable copy of a Windows system drive that can boot and run directly from an external USB drive. NEW! Configurable Startup Disk — creates a customized startup environment for Casper Secure Tech Edition on a USB flash drive or CD/DVD with options to add additional storage and network drivers, custom drivers, custom network settings, and more. Designed for Windows — provides complete disk imaging capabilities entirely from within the Windows environment. 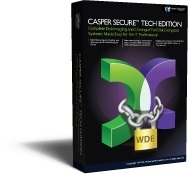 Since Casper Secure Tech Edition was designed from the ground up to image disks directly for Windows, Casper never requires the original system or destination hard disk to be removed after completing a copy — the source and destination hard disks can coexist in the computer at all times. Advanced Disk Management — provides advanced disk management functionality. Use Casper Explorer to review past activities performed with Casper Secure Tech Edition, create and remove partitions, change the active partition, change a drive letter assignment, replace damaged or missing boot records, and more. SmartResume is currently supported only for volumes formatted with the NTFS file system.